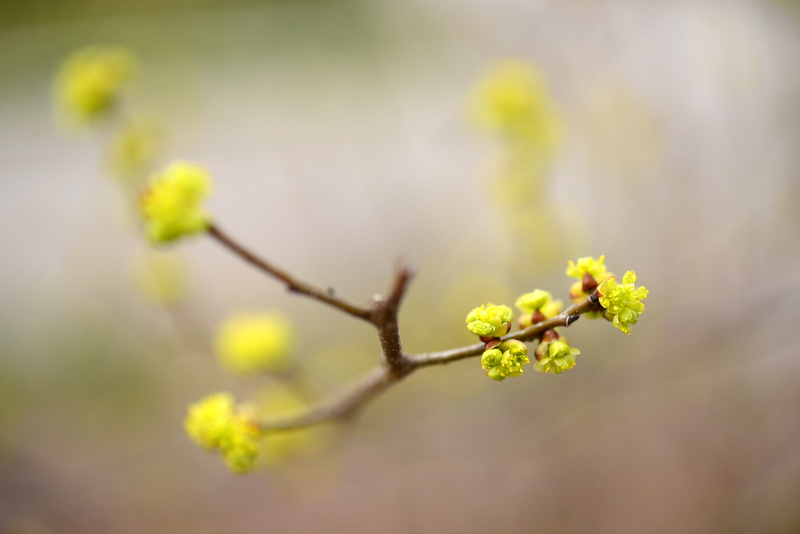 Spicebush (lindera benzoin) is one of the earliest native shrubs to bloom. This easy-to-grow and adaptable plant thrives in part shade and is not fussy about soil. Look for its delicate chartreuse flowers in about two weeks. Here in the central part of Bergen County, the snow is gone, although in more northern towns quite a lot remains. The temperature has reached the 50s for the first time, springlike temperatures are predicted for the week ahead, and we’ve had the kind of gentle rain that encourage birds to search for insect food in lawns. All week I’ve been catching glimpses of pairs of hairy woodpeckers and cardinals, and the bird condo in my front yard is sporting new nest holes. Skunks have emerged from hibernation. Hazelnuts are in bloom, and spicebush buds are swelling. It finally really is spring. — direct sow seeds of early greens such as lettuce, spinach, arugula, mustard greens, and mesclun mix, plus peas and radishes. They’ll germinate and grow slowly at first, but with any luck you’ll have fresh salad greens in about 6 weeks. Sow a new crop every two weeks to ensure a continuous supply of spring greens until the weather heats up. — as you see new growth emerge, begin to clean up your perennial beds. Grab a handful of stalks hear the ground and gently bend them to break them off. Rake the detritus away and either compost it on site or, if you don’t have room for it, take it to your town’s compost center. This week I’ll begin clearing the shady gardens where spring-blooming perennials grow; by the first week in May, all the beds will be cleared and ready for division or additional plants. — once you can explore your entire property, evaluate the winter’s damage. Don’t remove dead wood or broken branches unless they pose hazards to people or property, because they might be supplying food or shelter to winter-weary creatures, but see what will need doing. How much mulch will you need? 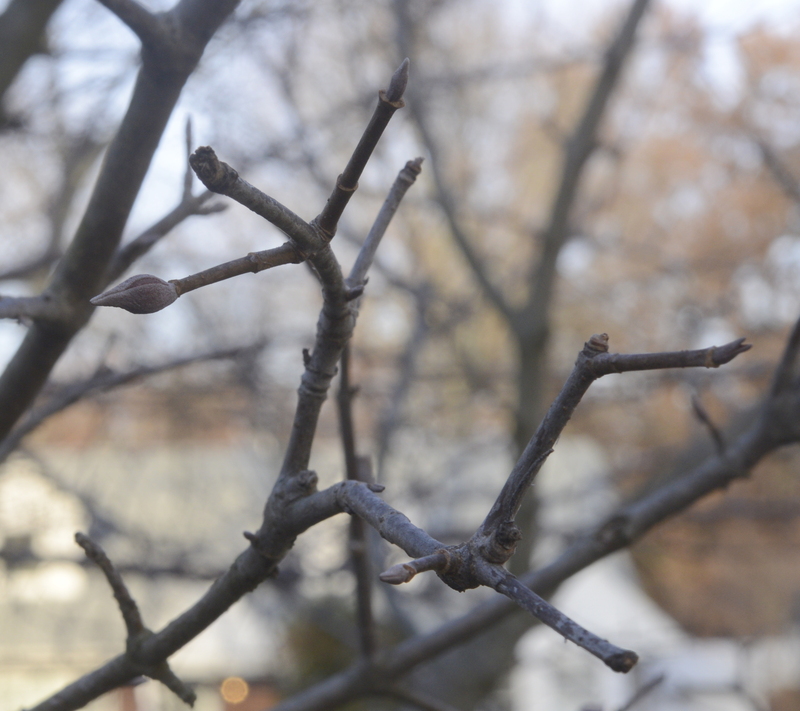 Will your evergreens need spring pruning to remove winter damage? — it’s not too late to extend a garden bed or start a new one, and it’s always a great idea to eliminate some lawn: spread a 3-4 inch layer of cedar or hemlock bark mulch over the area now to kill the grass. You’ll be able to plant in April or May. — monitor your garden for bird activity. Spring migrants are arriving and winter residents are very active at foraging and nest building. 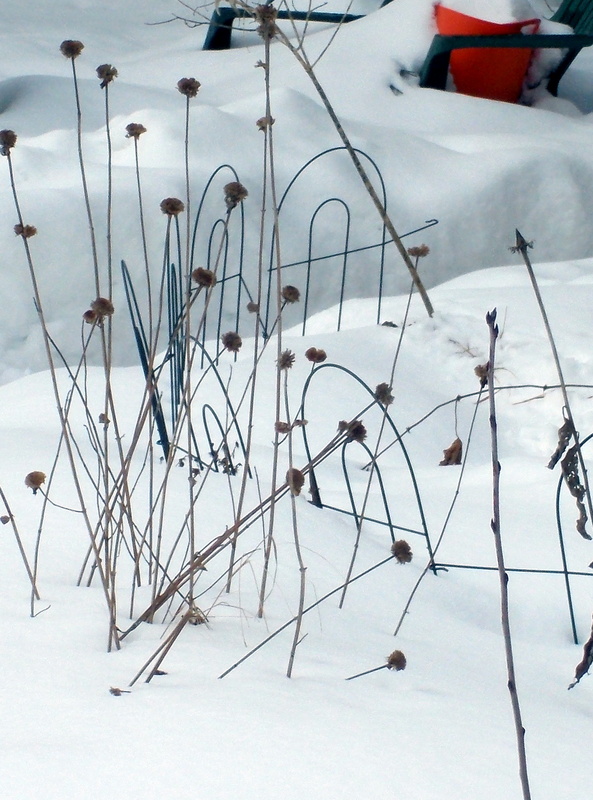 If you’re not seeing this, maybe your garden lacks winter food. There should still be perennial seeds, berries of less desirable plants, and leaf litter and dead wood for the birds to search for insects. If you’re not seeing birds now, consider what you can do this season to attract them: for example, plant native perennials, stop pruning dead wood quite so aggressively, stop using pesticides. — order your perennials and woody plants now to get the best selection. (Most local nurseries sell only a very few native species, so I rely on mail order and on specialty nurseries that are up to four hours away.) If you wait until it’s time to plant, nurseries will be sold out of many species. — buy your vegetable seeds and start them indoors according to this schedule so the seedlings will be ready for spring planting. 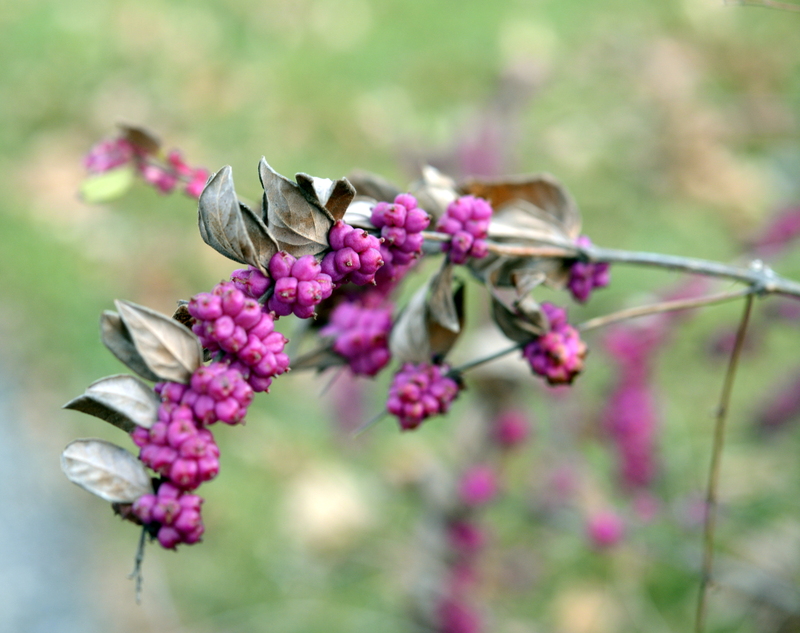 This picture was taken in late December, but even now there are a surprising number of colorful berries left on the coralberry shrubs. This year, the snow is still over a foot deep around the tree. 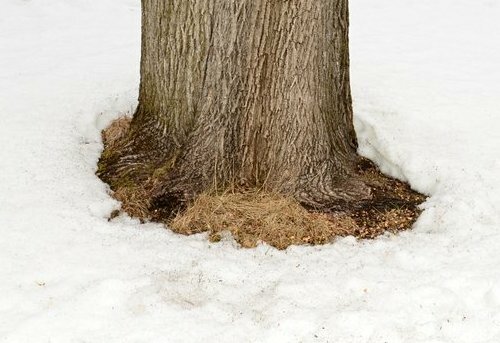 The ring of melted snow is caused by heat reflected off the dark bark of the tree (not, as I had thought, kinetic energy resulting from running sap). But speaking of sap, we can expect sugaring season once daytime temperatures go above freezing fairly consistently, as they are expected to next week. 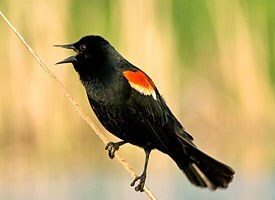 One of our earliest arriving spring migrants is the red-winged blackbird, and according to the Journey North site for that species, one was seen in the Teaneck Creek Conservancy on Feb. 22. I’ve heard other anecdotal reports of local sightings, so keep a lookout near streams and wetlands, prime nesting sites for these lovely and loquacious birds. Speaking of wetlands, I would expect to see snow melting around skunk cabbage very soon, if it hasn’t started already. This weekend will be a good time to get out in the field and take a look. It’s hard to believe, but within just two or three weeks we can expect to see flowers on early blooming species like vernal witch hazel, native hazelnuts, and, or course, early spring flowering bulbs. Keep a lookout next week if the weather really does warm up, and don’t forget to order your seeds and to start your seeds indoors. Why, it’s almost time to start your tomatoes!
. . . the pendulum has in fact reached the height of its swing, has stored more energy than at any other time of year, and is poised to descend with all the gathered momentum of warm summer days down through the cold to spring. Energy is stored in the goose that has been eating our grass all summer, in the honey the bees have stored up in their hive, in the fruit and in the sweet sap trees have stashed in their roots. Energy is stored in fruits, in buds, and in rosettes of new green leaves. It’s all there, ready for spring. You just have to look for the signs. Many perennials grow next year’s leaves in fall. In this photo, taken this week, you can see spring leaves of columbine, spiderwort, and queen of the prairie. 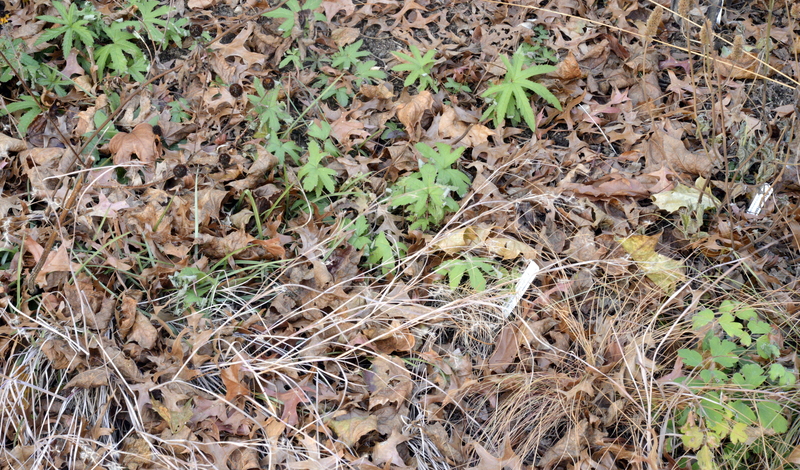 A goldenrod plant has grown a large rosette of leaves and several small offshoots. Viburnum prunifolium has produced big fat flower buds that are clearly distinguishable from smaller leaf buds. 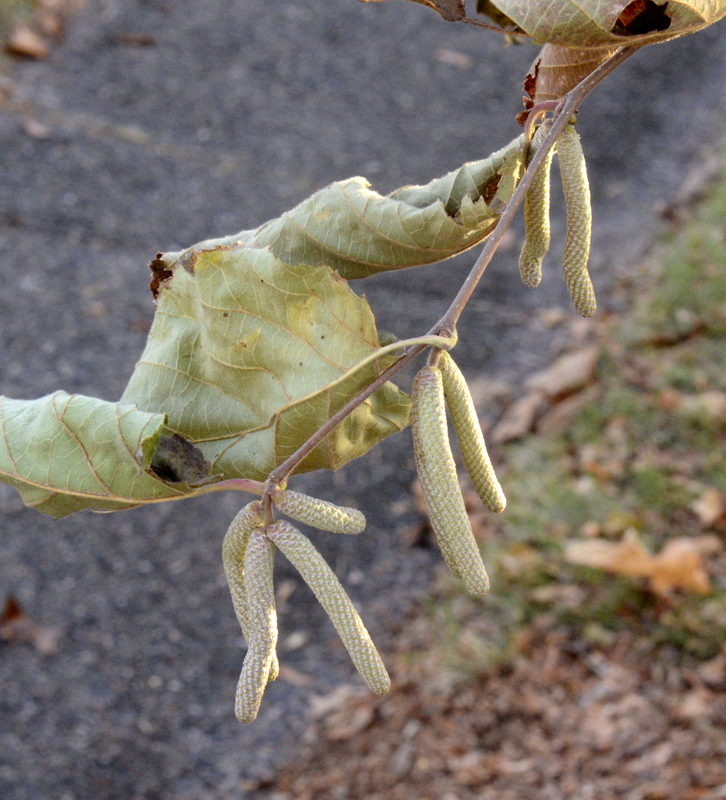 And the catkins–next spring’s male flowers—of hazelnuts are fully formed and waiting for warm weather to elongate and release pollen. I don’t know about you, but now that spring is really here, if I have a choice between writing about gardening and gardening, I’ll choose gardening. So I don’t have a lot of time to write this blog or my column right now. But I thought I’d share some interesting links–after all, you have to come inside sometime. 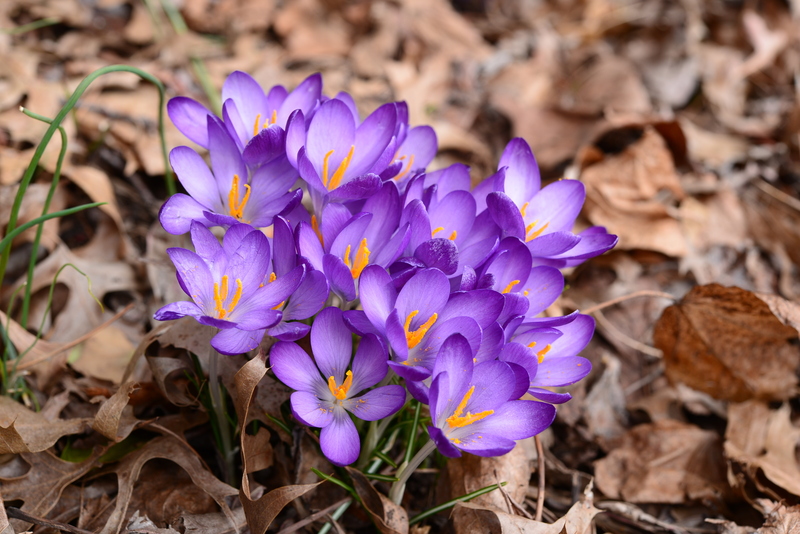 The NY Times ran an article today about the late spring we’re having and how because so many things have been delayed, many species that usually bloom sequentially will bloom all at once. I can’t wait. And I’ve been following a really interesting blog called Beautiful Wildlife Garden written by a group of wildlife gardeners from all over the country. Somehow they all seem to get great pictures of the wild animals in their gardens. I’ve GOT to get my cold-weather vegetable seeds in. It seems like every day for the past month, the weather forecast has predicted higher temperatures than we’ve actually experienced. I think the meteorologists are as sick of cold weather as the rest of us, so they’re giving optimistic forecasts. Today, for the first time, it’s nearly as warm as the forecast said. The temperature has been rising all afternoon, and I just spent a pleasant and anticipatory half hour in the garden, surveying the damage of winter and the promise of spring. This year’s spring cleanup will be a doozy. Leaves that usually either settle gently or get blown away were buried under two feet of snow and now form a compact layer. There are broken branches everywhere (even though I did remedial pruning whenever I could all winter). BUT . . . when I gently push some of the detritus away or just look closely, I see new growth everywhere. 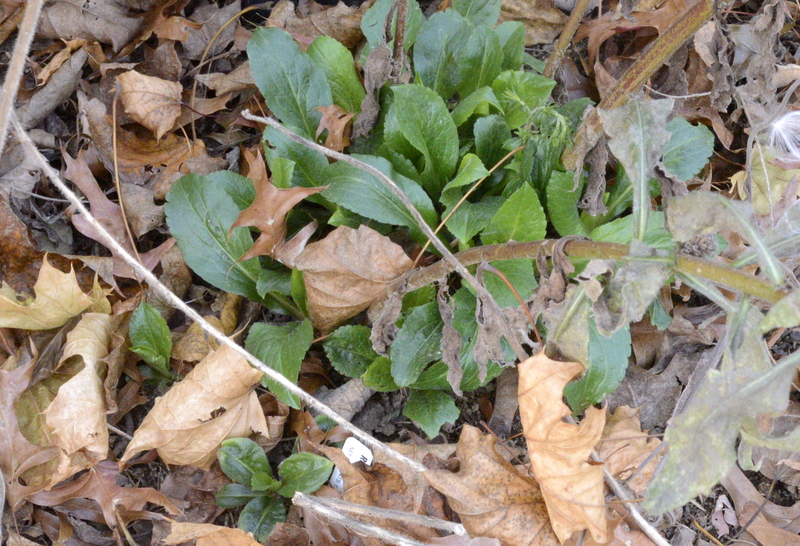 Perennials are starting to come up under the leaf mulch, and buds are starting to swell. I may be able to harvest some sorrel next week. The forecast now is for temperatures in the 50s for the next ten days. I’ve been waiting for a warm spell to sow early greens, patch the lawn, and uncover the earliest perennials. Maybe, just maybe, I’ll start all of that on Sunday. 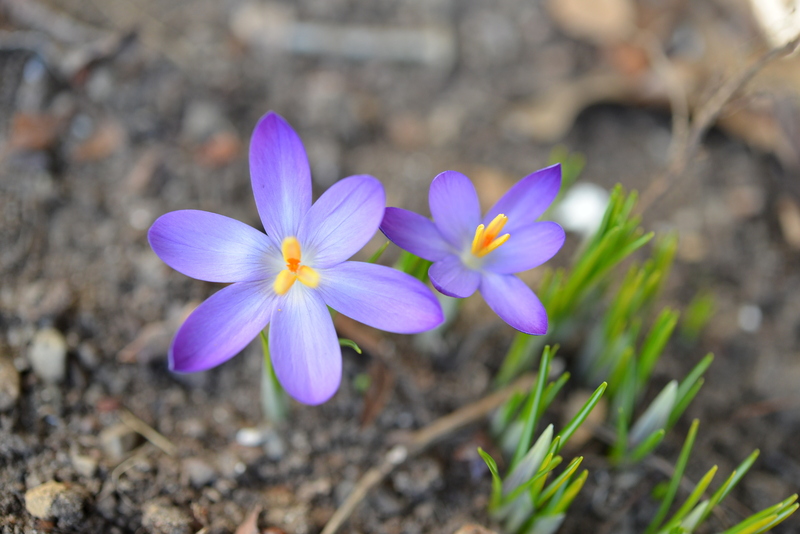 the first crocuses opened this morning. It’s February 18, the sun is stronger every day, the snow is trying as hard as it can to melt. Before last night’s snow, the temperature was ABOVE FREEZING yesterday for a few hours and is back up there right now. Most recent years, there have been many signs of birds’ springtime activities by this time. I see lots of birds daily in my backyard–cardinals, chickadees, juncos, jays—and certainly there are still lots of seeds on the plants that are sticking up above the snow, but I haven’t observed what I think of as spring mating activity—until yesterday. As we were walking along Harristown Road in Glen Rock, I heard a persistent chickadee mating call–the lovely “fee-bee” two-note call, a descending minor third. It’s sad to think that in a more normal year the crocuses would be in bloom already and the daffodils would be up. But spring will come. The birds know that.